Panasonic’s Intelli-Balance™ 100 is an ideal solution for single-family homes and multi-family units in need of a customizable, high performance, high efficiency Energy Recovery Ventilator (ERV). The solution is a unique and cost effective ERV engineered for total versatility and installation flexibility for any North America climate zone. Panasonic Intelli-Balance™ 100 ERV uses four integrated dual 4” or 6” round duct adaptors – two to exhaust stale air and two to supply fresh air. Its low, continuous run helps remove unwanted, stale air and replaces it with fresh air. The solution is also equipped with revolutionary ECM motors with Smart Flow™ technology to ensure optimum CFM output as well as the Pick-A-Flow speed selector (50 to 100 CFM) providing customizable airflow to create balanced, positive or negative pressure within the home. 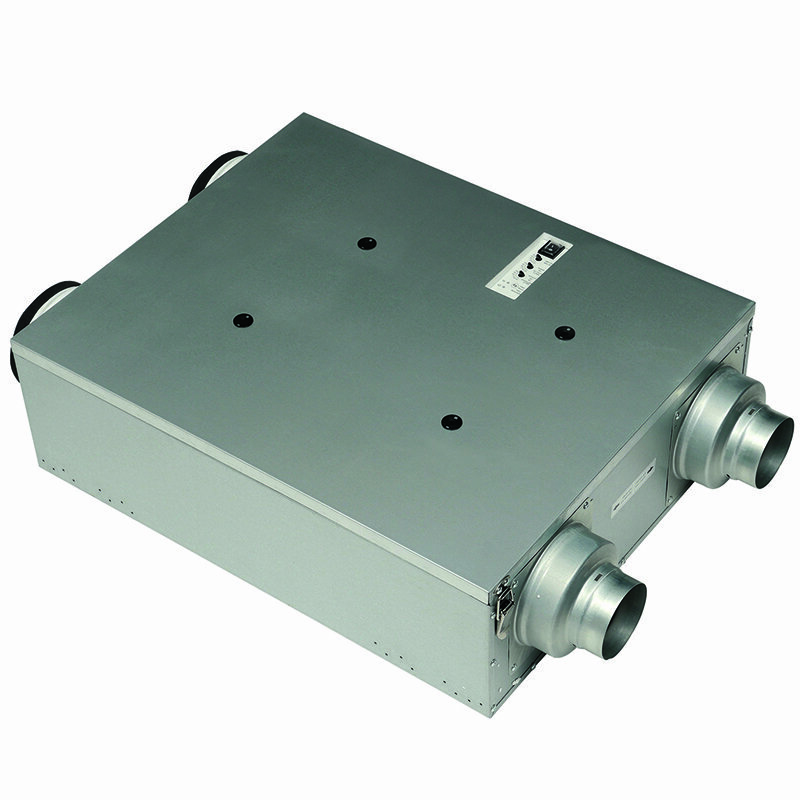 Additionally, Intelli-Balance™ 100 can be ceiling or wall mounted and does not require a connection to a central HVAC unit or the addition of a condensation line. This flexibility allows it to be installed in many places throughout the home to meet IAQ, health and comfort needs. Panasonic’s Intelli-Balance™ 100 uses two ECM brushless motors with built-in SmartFlow™ technology for precision ventilation. With SmartFlow, when the ERV senses static pressure, its speed is automatically increased to ensure optimal CFM output regardless of a complicated duct run. This feature provides peace of mind for builders and contractors because they do not have to worry about compromising the ERV’s performance. Additionally, both ECM motors are rated for continuous run and are enclosed to ensure long-life and continuous quiet operation. Each motor also comes equipped with a thermal cutoff fuse. Intelli-Balance™ 100 also includes a built-in Pick-A-Flow™ speed selector that provides the unique ability to select your required supply (50-60-70-80-90-100 CFM) and exhaust airflow (50-60-70-80-90-100 CFM), with the simple turn of a dial. This truly customizable airflow capability allows builders and contractors to create balanced positive or negative pressure within the home. Intelli-Balance™ 100 is also a cost-effective solution that makes it easier for builders and contractors to meet ventilation requirements for green building standards, like ASHRAE 62.2 and Energy Star. Intelli-Balance 100 is equipped with built-in Pick-A-Flow airflow selector, which gives the customer the unique ability to select their required airflow (50-150 CFM, in 10 CFM increments) with the turn of a dial, giving them the flexibility and assurance that one fan will satisfy a range of ventilation design requirements. The result ensures that the fan is performing as intended. Intelli-Balance 100 also has two filters that clean the exhaust and supply air before passing through the ERV core, extending the life of the core. The solution comes equipped with a light indicator and unobtrusive alarm signal on the access panel will help inform the homeowner when it’s time to check and clean the filters. Additionally, Panasonic’s patented capillary core tempers supply air while transferring moisture in both summer and winter months, making the Intelli-Balance 100 system perfect for any climate. The result makes for a healthier and more comfortable living environment. Finally, Intelli-Balance 100 is ideal for meeting whole house ventilation requirements under ASHRAE 62.2 and an ideal choice when partnered with mini-splits or VRF Heat Pumps for fresh, balanced air with energy recovery.